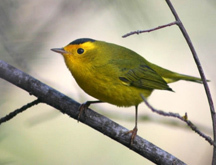 The Wilson’s Warbler is a long-distance migrant that makes short-distance upslope movements after the breeding season to undergo molt at higher elevations. Photo by Michael Woodruff. Birds in the western United States time their breeding and molting (annual replacement of feathers) behaviors with seasonally abundant food resources. Understanding how birds move across the western landscape to acquire the food they need to successfully breed and molt represent critical pieces of information for wildlife managers. To measure bird movements in the western United States, researchers from Klamath Bird Observatory and U.S. Forest Service Pacific Southwest Research Station have been capturing and marking birds throughout northern California and southern Oregon. These data have now been used to analyze movements of breeding and molting birds to better understand the habitat requirements of multiple species throughout their annual life-cycle. “After the breeding season, many species were found to move away from their breeding grounds before they began molting” says Jared Wolfe, co-author and KBO research associate. “My graduate student leading this research, Andrew Wiegardt, and I, in addition to the KBO scientific team, believe that dry, late-summer environments prevent many birds from remaining on their breeding grounds late in the season. To find the insect and fruit-rich habitats necessary to molt, many birds left their breeding territories and made small-scale movements to environments with more food, such as wet meadows and riparian forest”. Results from this recent research highlight that most migratory species are reliant on multiple locations and habitats in northern California and southern Oregon to breed and molt prior to fall migration. 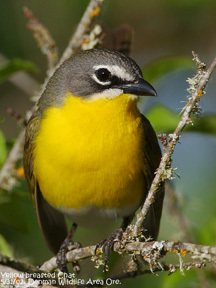 For long-distance migrants, such as Wilson’s Warblers, these different locations used for breeding and molting often occurred on an altitudinal gradient where birds tended to breed in lower elevations during the spring, and then moved upslope to molt at higher elevations late in the summer. The findings of this study were published in the March 2017 issue of Journal of Field Ornithology and the October 2017 issue of Ecology and Evolution. KBO Research Associate Dr. Jared Wolfe received his BS and MS from Humboldt State University. He completed his PhD at Louisiana State University studying landscape demography of Amazonian birds. Dr. Wolfe is a science advisor for Costa Rica Bird Observatories, co-founder of the Louisiana Bird Observatory, North American Banding Council certified trainer and current board member serving as a trainer-at-large, and a permitted master bander in the USA and Brazil. He regularly coordinates bird monitoring and statistical workshops in the USA, Costa Rica, Peru and Brazil. Dr. Wolfe is an Assistant Professor at Michigan Tech University. Jared’s affiliation with KBO has been long and fruitful, resulting in multiple scientific publications focused on migratory and resident bird demography as well as the influence of climate on migratory bird condition, molt patterns and novel ageing systems for tropical birds. KBO at the 2018 Cascade-Siskiyou National Monument Research Symposium this Thursday! Friends of Cascade-Siskiyou National Monument, with support from the Bureau of Land Management, will host the 2018 Cascade-Siskiyou National Monument Research Symposium this Thursday March 15 evening. Come learn about recently-conducted fieldwork from both students and professional scientists within the Monument in our backyard. KBO Executive Director Dr. John Alexander will present the Symposium keynote with a talk titled “KBO Science Informing Adaptive Management and Conservation in Our National Monument”. His talk will explore the more than 20 years KBO has been conducting monitoring and research in the Cascade-Siskiyou National Monument in collaboration with the BLM and many other partners. The results have and continue to inform adaptive management that improves ecological conservation. Dr. Alexander will summarize these results, focusing on how KBO’s science has helped to shape management actions that have benefited migratory birds, ecosystem health, and biodiversity in the Monument. The Symposium will be held at the Southern Oregon University Science Auditorium (CLICK HERE for map) March 15, 2018 from 7 pm to 9 pm. CLICK HERE for more information about the 2018 Cascade-Siskiyou National Monument Research Symposium. We described the start of the Yellow-breasted Chat geolocator project in a previous blog post (CLICK HERE TO VIEW). Geolocators are lightweight devices designed to track a birds’ whereabouts by recording daily light levels. These novel data can then be used to determine migratory routes and wintering grounds—we need to know where birds go when they leave their breeding grounds before we can understand potential conservation needs during migration and winter. Since then, we have recruited a Ph.D. student, Kristen Mancuso, who is supervised by researchers at the University of British Columbia and Environment and Climate Change Canada. KBO’s Executive Director, John Alexander, is an advisor on her committee. She is studying chats in British Columbia, northern California, and Mexico—throughout the range of the western subspecies. Here is a project volunteer’s account from last year’s field season! On my first day with the Yellow-breasted Chat project, I woke up to a dark, early morning with more than a bit of chill to the air. Since it was my first day, I would have the help of veteran chat-catching volunteer Kachina Rowland and the project leader Kristen Mancuso. We were on the hunt (to catch and release!) chats that wore color bands on their legs which meant they also wore a geolocator device we needed to remove for its record of where they had been since last year. We had made our way to a site the team had been to several times before (unsuccessfully) to catch the notorious Dark Blue-White-Dark Blue-metal (DWDX for short). As the sun rose high over the hills and the day turned long, Mr. DWDX had managed to evade our nets. In fact his constant chattering song seemed to mock our best efforts. Disappointed but still game, we tried elsewhere looking for color-banded chats in riparian forest overgrown with blackberries that chats seem to love. Chats make a confusing variety of grunts, chatters, and whistles, so we had to keep a sharp ear out for any of their more subtle call notes. We found several singing males, but none of them were color banded. The day ended warm and sunny but with just three more days left to find our chats! The next morning we trudged through streams, rocky hills, and blackberry bushes and while we found several chats, none of them were banded. About to give up, we finally heard one last male singing in the distance and scouted his territory before calling it a day. We split up to opposite sides of this chat’s bramble. I caught glimpses of him flying back and forth across an opening in the trees, but I couldn’t see his legs well enough to tell if he had any color bands. I was moving to a better location when Kristen spotted him—and his bands! This male had a geolocator and we were determined to catch him the next day. A successful day deserves a reward and after we got back to camp we treated ourselves to s’mores around the campfire. On the next to last day in the field, we trudged over and through yesterday’s streams, rocky hills, and blackberry bushes to set up nets for our newly found bird. We set up wooden decoy males by the nets even though the other birds the team had tried to catch weren’t falling for this trick. However, within minutes of playing a recorded male song at the decoy, our male flew in the net! Gotcha! We removed his geolocator, took measurements, feather samples, and snapped a few pictures before setting him on his merry way. We even had enough time left in the morning to try for old DWDX again! Nets and decoys were deployed for him but we weren’t able to repeat our morning’s luck. A lovely female Black-headed Grosbeak in the net did brighten my mood before we headed back to camp. The last morning was full of promise as we attempted to catch DWDX one more time. We set up nets in a different location, but still weren’t able to convince him to come into our nets. We did, however, catch his previously unbanded neighbor and outfitted him with some spiffy new bands before we let him go. As the day wore on, we became less and less hopeful. However, a feisty Red-breasted Sapsucker caught in the net was just the pick-me-up we needed to end the day on a good note. We may not have caught our nemesis, but we left with smiles on our faces. Now Kristen moves on to British Columbia to catch returning chats there, as Kachina and I return to regular life, with a bit more knowledge and experience under our belts. Editor’s note: The 2017 Yellow-breasted Chat banding team, comprised of PhD student Kristen Mancuso, KBO Research Biologist Sarah Rockwell, and Humboldt State University volunteers Kachina Rowland and Kelly Commons, recaptured three males with geolocators this season, nearly doubling the sample size from the Trinity River region. We even recovered one from a male who had dutifully carried his geolocator backpack since 2014! The National Geographic Society, in partnership with National Audubon Society, Birdlife International, and The Cornell Lab of Ornithology have proclaimed 2018 as the Year of the Bird. The Year of the Bird marks 100 years of the Migratory Bird Treaty Act—the most powerful and important bird-protection law ever passed. The Year of the Bird will celebrate the wonder of our feathered friends and provide an opportunity for people everywhere to recommit themselves to protecting birds. The Year of the Bird will be 12 months of storytelling, science, and conservation aimed at heightening public awareness of birds and the importance of protecting them. KBO, many other organizations, and people all around the world are committing to help protect birds today and for the next hundred years. 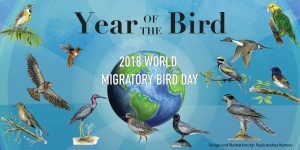 Everyone can join in and be a part of the #YearoftheBird! National Geographic will be highlighting simple actions you can take part in each month to make a difference for birds—visit their website (see link below) to read more about this special year. Another wonderful resource is the All About Birds website’s “6 Resolutions To Help You #BirdYourWorld In 2018” (see link below). KBO will post news and updates of these actions and how to stay involved throughout the year through our Call Note blog and at eBird Northwest. CLICK HERE to visit National Geographic Society’s website Year of the Bird page. CLICK HERE to visit The Cornell Lab of Ornithology’s website “6 Resolutions to Help You #BirdYourWorld in 2018” article. Klamath Bird Observatory is partnering with Intermountain Bird Observatory to launch the pilot year of the Western Asio Flammeus Landscape Study (WAfLS) in Oregon. This citizen science project, now spanning eight western states, is designed to gather information to better evaluate the population status of the Short-eared Owl. 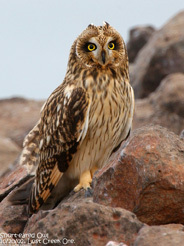 The Oregon Conservation Strategy has identified the Short-eared Owl as a Species of Greatest Conservation Need and the National Audubon Society Climate Initiative has identified the species as Climate Endangered. 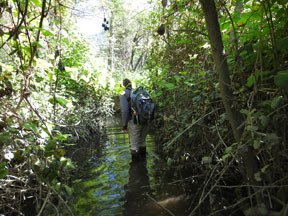 This pilot survey is a critical starting point to fill information gaps for this species in Oregon. Results will directly influence high-value conservation actions by state and federal agencies. We are looking to recruit dedicated volunteers to help complete this state-wide survey. WAfLS volunteers will enjoy rural Oregon at twilight while completing two road-based surveys during late winter and early spring. The surveys consist of driving on secondary roads, stopping at 8 to 11 points to complete a five-minute survey. At each point volunteers will record detections of Short-eared Owl as well as some brief habitat information. The entire survey is completed within 90 minutes. Training material will be provided and no experience is necessary to volunteer. Participants will need to follow field and data entry protocols, have use of a vehicle, smartphone or GPS device, and be able to identify a Short-eared Owl. CLICK HERE to visit the WAfLS project website for more details including the protocol, survey maps, past years’ reports and publications and how to sign-up. 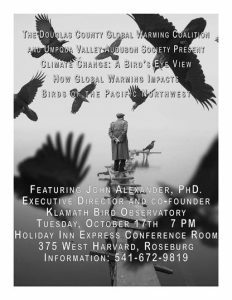 Contact Ellie Armstrong at eea@KlamathBird.org for any questions regarding the Oregon surveys. Help fill these information gaps by signing up for a survey! Oregon Vesper Sparrow in the grasslands of the Cascade-Siskiyou National Monument. (c) K Schneck. The Oregon Vesper Sparrow is a subspecies of the Vesper Sparrow, a migratory grassland-obligate bird. This subspecies nests to the west of the Vesper Sparrow’s continental breeding range. 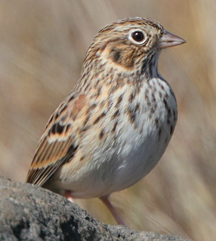 The Oregon Vesper Sparrow is at risk of becoming extinct. However, KBO’s science is informing important steps in its conservation. In early 2017, new protections for Oregon Vesper Sparrows that breed in grasslands adjacent to the Cascade-Siskiyou National Monument were put in place when President Obama issued a proclamation that doubled the size of this Monument. The expansion increased the amount of grassland habitats that occur in the Monument, and thus in the Region’s network of protected areas. Klamath Bird Observatory’s science informed President Obama’s decision to expand the Monument. The expansion focused on at-risk species and considered ‘ecological’ boundaries to provide further protection for the biodiversity for which the Monument was originally established. Specifically, Obama’s proclamation expanded protection for grasslands and oak woodlands that are critical for bird conservation — habitats that occurred near but not within the original Monument boundary. One of KBO’s most recent peer-reviewed papers identified these habitats as underrepresented in our regions National Parks, Wildlife Refuges, and Monuments. President Obama’s expansion of the Cascade-Siskiyou National Monument was driven by this and other regionally relevant science. As a result the expansion benefited some of Oregon’s most at-risk and under protected birds, including the Oregon Vesper Sparrow. Despite this success story, the Vesper Sparrow still faces significant conservation challenges. A petition to list the Oregon Vesper Sparrow under the Endangered Species Act has been submitted to the US Fish and Wildlife Service. The species is at-risk of extinction because 1) it has a very small population (estimated at <3,000 individuals), 2) for the past half-decade this population has been declining by 5% per year, and 3) ongoing habitat loss and degradation continues to threaten the grasslands that Oregon Vesper Sparrows depend on for nesting. Adding to these challenges, there is uncertainty about why this species is in such decline. For us to effectively save this species there are key questions we must answer about when and where during its annual cycle it is most threatened. Which threats — threats to its breeding, migratory stopover, or wintering habitats — are most ‘limiting’ to this subspecies? KBO is collaborating with the American Bird Conservancy and many other partners to answer these questions in order to better prioritize conservation actions that will stabilize and reverse its population declines. 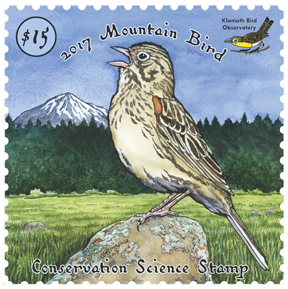 The Oregon Vesper Sparrow is featured on KBO’s 2017 Conservation Science Stamp — CLICK HERE to learn more about our Conservation Stamp Set.